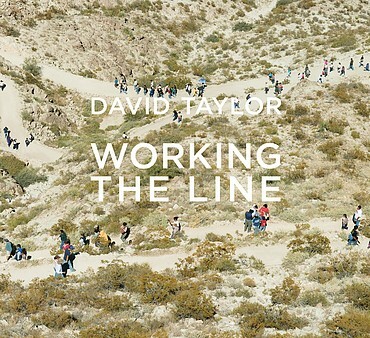 David Taylor's Working the Line, is two volumes, Working and The Line. For three years, Taylor traveled between El Paso, Texas and Tijuana, Baja California, photographing the border of the United States and Mexico. The Line, a double-sided accordion fold volume, contains his photographs of the border monuments, 258 white obelisks that chart the official border. The accordion fold is a wonderful way to present these images as it allows you to consider them in a circular fashion; you end up where you started. Most of the images here are typologies: the monument is in the middle of the frame with enough of the surrounds to see whether it is located in an urban center or the proverbial middle of nowhere. The photographs that break this convention are some of the most compelling; in "Border Monument 222" the obelisk is secondary to the family sitting under the shade of a ramshackle porch. In the background, the open vistas of the desert are annihilated by the recently constructed border fence. It is an apt visualization of the border as barrier. The other volume of photographs, Working, is a traditional book. The photographic cover uses glossy ink to print, and hide, the words "The Line" so they're both there and not there. (The same effect is used on The Line to hide "Working.") It is a clever metaphor for the border. I have a few frustrations with the physical book though: the cover image is starting to peel away from the corners and many of the photographs cross the gutter. This is often a disservice to the image, but is mitigated by a binding that allows you to open the book perfectly flat. The print quality is incredibly high, almost frame-able, and the introductory essay by Hannah Frieser and Luis Alberto Urrea's rumination on the border are excellent. Anecdotes are scattered throughout the pages and all the texts are in English and Spanish. I presume Working came about from the experiences and relationships Taylor made in his efforts to photograph the border monuments since he needed assistance from the Border Patrol, private land owners, and officials in Mexico. Working gives us an in-depth look at what life at the border looks like. You'll find the border fence, smuggling routes, offices, confiscated drugs, watering holes, armories, holding cells, expansive vistas, broken fences, detainees, and bisected towns. One of the strongest juxtapositions in the book occurs in the first pages: one image is of a Border Patrol agent at a shared desk, engulfed by paperwork, the other of two smugglers standing in the expansive desert. Your opinion of these people will depend heavily on which side of the line you're on, but Taylor himself is not taking sides. There is a clear respect for the border agents, but equal sympathy for the migrants exploited by the "Coyotes." This border, perhaps all borders, is a complicated construct that is difficult to describe and impossible to summarize. Working the Line gives us an even-handed, honest view of this highly polemicized line. David Ondrik is an Albuquerque, NM based photographer and teacher. To see more of David's work, please visit his website.